Big Star was one of the handful of bands who most shaped my musical tastes at the crucial age of 14-18 or so. Radio City and Sister Lovers/ Big Star Third are icons of my personal aesthetics (I never loved #1 Record as much), but ironically I haven’t had either of them on MP3, other than some tracks included on an Alex Chilton cd collection. So Keep Your Eye on the Sky, the Big Star box set, which is full of demos, alternate tracks and some early live recordings, was a really cool birthday gift (thanks Jake). Getting it also inspired me to pick up the Continuum 33 1/3 book on Radio City. No one I knew had ever seen them play. I think I’d read that one of the guys had been in the Box Tops — which made no sense either. Information was scarce. So these records they’d put out, they were simply artifacts. It was like seeing the heads of Easter Island or the Great Pyramids or something. You didn’t know what they were or how they’d gotten there. By the time I got into Big Star in 1984 or so they were a lot better known, but even so, you couldn’t Google them, there was so Wikipedia page, so you ended up relying a lot on the little Robert Christgau capsule reviews or the Rolling Stone Record Guide entry and the like. Going through the box set and this book now offers a surplus of information and photographs that once and for all eliminates that numinous haze, born of a paucity of information, that used to surround the band — but at this point, that’s perfectly OK with me, as they deserve all-time-great historical status, with all the archival trappings. Bruce Eaton’s 33 1/3 book is quite good. It’s austere in its formalist focus on “the music itself” — Eaton starts out explaining that because of all the gossip, rumor and falsehoods surrounding the Big Star and Alex Chilton stories, he’s going to focus pretty exclusively on the actual process by which the band formed and made Radio City. This involves a fair amount of to me, somewhat boring technical chitchat about production choices, recording and mixing, etc., but on the other hand, I did feel I got a better understanding of what was musically/technically special about the band and the importance of the producer John Fry. I also suspect there may have been a strategic element here, as Eaton makes clear that Chilton has expressed zero interest, in recent years, in talking with any journalists, and it sounds as if Chilton agreed to participate on the condition that the interviews would be almost exclusively about the music and recording. Big Star opened for Badfinger in Boston in March 1974, one of their few performances ever outside Memphis; their instruments were stolen and they had to play with gear borrowed from Billy Squier (! — yes, of later “The Stroke” fame!) of local band Sidewinder. Notwithstanding the point about Chilton’s partial disaffection from the “whiteness” of Big Star’s approach, Chilton himself says that he copped certain musical structures and ideas on Radio City from Bach and other Baroque music… which actually kind of makes sense. During and after Big Star, Chilton was in a semi-/unofficial pickup studio band called the Dolby Fuckers. Surprised no one’s ever borrowed that name. Eaton makes some good points about the difference between Big Star and other “power pop” bands of the era sometimes associated with them (like the Raspberries or Badfinger). While the latter were classicists trying to work entirely within pre-established musical structures, Big Star (after #1 Record especially) was always about taking and reproducing those kinds of pop structures but messing with them, disintegrating them, removing the ground beneath them. This then builds to an extreme on Big Star Third which is still unparalleled as a woozy, druggy, depressive, achingly gorgeous collection of songs. One more thought: I was fascinated to hear the Flying Burrito Brothers cover (“Hot Burrito #2”) in the live set on the box set. Chilton seems to have more than a few things in common with Gram Parsons as a musically omnivorous, addictive, louche son of privilege (well, relative privilege in Chilton’s case) with an ambivalent relationship to pop music in what was becoming the New South. I saw Alex Chilton in 1985 at the Rat in Boston. I was 16 and had the most ridiculous fake I.D. I was desperate to get in and was thrilled that I did. If I recall correctly he played stuff from Feudalist Tarts and various R&B covers and then a few Big Star songs like “September Gurls” which made me very happy. I think I ended up walking all the way back home to Cambridge from Kenmore Square at 2 a.m. or whatever. The box set contains an amazing collection of photos. My favorite is one of Chilton at age 20 in the Chelsea Hotel in NYC with long hair, tie-dyed tank top (!) and scruffy facial hair holding a copy of the Byrds’ Untitled. This photo above is from the back of Radio City: Jody Stephens, Andy Hummel and Chilton — in the original T.G.I. Friday’s in Memphis! Did you ever get into the Chris Bell solo album, –I am the Cosmos–? Somehow I can’t really listen to Big Star (esp in mp3 format) due to the 1000s of times I listened to each song in the 80s. Or maybe that’s just because I usually come in through estoteric tracks–demos and live–that just don’t sound as good as the originals. But the Chris Bell solo Cd is great, and has just been reissued with a 2d disc of assorted stuff–some of which I think also wound up in the Big Star box. Hi Ivan, nice post. I’m debating whether to but the box set even though I have all the albums on CD. I’m not really the type to buy remasterings–havent got any Beatles new CDs e.g.–but the demos intrigue me. I think you’re right about this being about the Southern bourgeoisie–you could extend that up to R.E.M. I heard about Big Star in an interview with Peter Buck I read in about 1983. I remember buying it as an import in New Haven for like $19, the most I’d ever spent on a record. The cover image was weirdly intriguing and off-putting, but also very Southern. You could practically taste the bourbon in those glasses they’re gripping. But that sort of Southern was so very different from the pristine, baroque sound on the LP. Do you remember when Chilton played at Morse College in 1986 or 7? Cattle Collision opened and we were told in advance to buy pot for him. I think this story may actually involve Blue in some capacity but I’m not quite clear in my memory and I don’t want to get into any trouble… so probably not… Anyway, Scott Weissman, Jay Tobler and I went to some guys in your year we knew could sell us some weed and purchased a bag. While we were paying we mentioned something about Chilton and his people contacting us and the dudes were like, “Wait, this is for Alex Chilton?” and went back and got a bag from a different stash, not the everyman crap they were going to sell to us. thanks for the write-up! 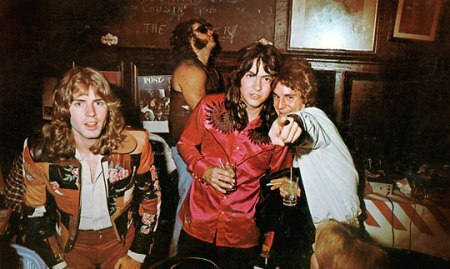 never really thought about Big Star being the first critics band but that may be a valid point indeed. at least one pondering and discussing on a cold winter’s night. you’re correct about why I focused on the music. everyone was willing to cooperate and as a result I think I got some material that otherwise wouldn’t have come to light. so I started with the assumption that most Big Star fans would have already read about the surrounding “drama” (as Richard Rosebrough put it) anyway. some of the drama was true and some was exaggerated or even mythical and the people who were actually involved have little to no interest in sorting that out. given the space limitations of the 33 1/3 format, I decided not to use up space in that territory. the book could have easily been twice as long. Don Quixote: I never did get super-into I Am the Cosmos, though I like the song itself a lot. I should check it out again. Gus: I had totally forgotten about that show but now I do remember it. It’s interesting, when I saw him in 1985 I couldn’t believe I was really going to see him perform, it felt extraordinary and magical; I think by the Morse show the Replacements tribute had come out, he’d become a bit of a (short-lived) college radio staple and it didn’t feel as special to me anymore, though I’m sure I was psyched to see him again. Thanks for the comment, Mr. Eaton! I’ll check out that interview. Congrats on what I thought was one of the best 33 1/3 books I’ve read. did anyone see the film “Adventureland”? Shockingly brilliant and period-appropriate use of “I’m In Love With A Gurl” in that movie, perfect for the summer of ’87, when the Big Star cult was in full flower. Rob you must have photographic aural memory! The details you remember from these shows. I can completely imagine Alex Chilton drawling that comment. I really liked ‘Adventureland’ and thought the use of period music was spot-on. That’s an apt point about ‘diminishment of “mystery and the mysterious” in pop music.’ I’ve been thinking about this a lot lately as I observe the magical fascination that certain objects hold for my 7 month-old son– I think the records I bought as a teenager were the final vestige of this in my personal experience, the last objects that had a talismanic property. I recall shelling out a then-risky $7-12 at Newbury Comics for some obscurity that I knew almost nothing about, peeling the shrink wrap off on the bus ride home, poring over the liner notes (if there were any) and practically trying to imbibe the album contents through my fingertips to figure out whether it was going to be good or disappointing in advance of getting home and playing it. As you say, Big Star was the perfect example of this vinyl-buying-on-a-prayer era that yielded its share of thrilling revelations and totally soul-crushing flops. There’s something to be said here about the metairony of the Replacements being linked to Chilton because he produced them in the studio and recorded a song about him, whereas the more significant link would have to do with an ethos of vital live performance that they both importantly made palpable. Wonder if there would’ve been any chance of a late-career Dylan-style return to ambitious songwriting for Chilton. I would have liked to have heard his “Modern Love” or whatever.